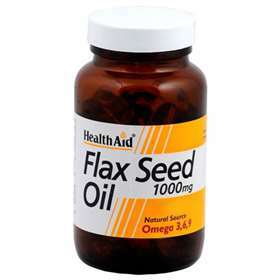 HealthAid Flax Seed Oil is a natural source of polyunsaturates and essential fatty acids. HealthAid Flax Seed Oil has many health benefits such as aiding digestion, decreasing inflammation as well as aiding healthier skin and hair. Flax seed oil can be used internally and externally on rough and dry skin. Free from yeast, gluten, wheat, dairy, sugar, salt, artificial colours, preservatives and flavourings. Natural source of omega 3, 6, 9. Benefits those with cardiovascular health problems or digestive disturbances. For adults and children over the age of 6. For oral use: Take one to two capsules daily. Do not exceed recommended dose. For external use: Pierce capsule and apply oil to skin and massage in until fully absorbed. Flax seed oil, capsule shell (corn starch, glycerol, carrageenan, sodium carbonate).